Quaint 3br Duplex. Close To Beach, Restaurants And Shopping! 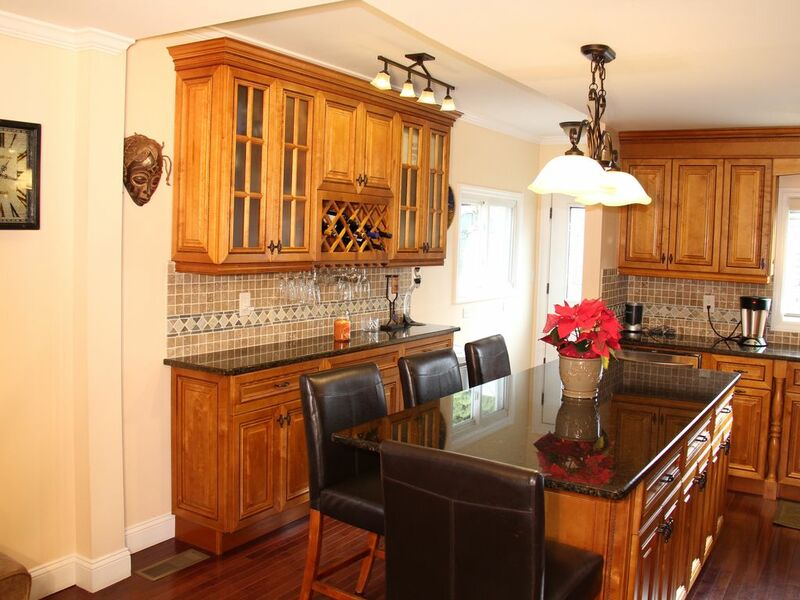 This property is minutes from the beach and also from the main streets of Port Chester, Rye and Greenwich, this fully renovated home boasts hard wood floors, washer dryer, central heating and air conditioning and a wonderful state of the art kitchen with granite counter tops. The property has 3 quaint bedrooms (bedroom #1: a queen bed, bedroom #2: a full (double) bed, bedroom #3: a twin (single) bed). Enjoy watching movies on the 4K ultra high definition TV in the living room. All bedrooms have TV's with access to Netflix and Amazon movies. Take the train or drive to Manhattan - less than 25 miles away. Centrally located to explore the Tri-State area by car. Enjoy a grill out on the back patio or walk to shops, movies, restaurants, beach, pool, parks, tennis, library, train station and so much more. Great area for walking or jogging near the water. We are a 15 min walk away from Byram beach and also from Port Chester that offers many restaurants, coffee shops, movie theaters, places to shop and the historic Capitol Theatre. The train station is a mile away. Greenwich Avenue in Greenwich's picturesque downtown is known for its great restaurants and many upscale shops and is only 7 min away by car. Rye Playland is a​ fun old fashioned amusement park and beach in Rye ​that is 10 mins away by car. Activities include biking, tennis, kayaking, and community sponsored activities such as concerts and movie nights. We live close by and are happy to provide assistance! My wife and I live nearby. We take pride in our property and are responsive to any of our guest's needs. We deal with our guests directly – from information, to cleaning, to repairs etc. Our two properties are fully furnished to make you feel at home! 15 minute walk to Byram beach. Beach towels also provided on request. Kitchen island seats 5. No separate dining rom. We stayed at this condo to attend some concerts at the Capital Theatre. The condo was in walking distance to the theatre which was great. The condo was extremely clean and the owner was very accommodating for our request for an early check-in and late check-out. The only suggestion I have is that the condo needs a few throw blankets. It was very cold for two days we were there and I was wanting a blanket to curl up on the sofa. If we return for more shows at the Capital Theatre, we will definitely stay here again. Extremely clean and well maintained rental. I would stay here again. Very clean and well maintained. Highly recommend it. This roomy duplex unit is well-located for driving access to Greenwich / Westchester County area and easy access to Greenwich or Port Chester train stations if using as a base for trips to NYC. We were spending Christmas with family in town and used this for overflow guests. The fully equipped kitchen/great room had plenty of seating, excellent large-screen TV. Bedrooms were fine, nice beds and clean, modern bathrooms. We were there in the winter but the back yard patio and lawn looked inviting nonetheless. As daily walkers, we enjoyed the quiet suburban streets and pretty shoreline in Byram Shore and Byram Park, We highly recommend as a great value to anyone staying in this area. Wonderful home in a relaxed neighborhood, great for a couple of friends or a small family. We drove about a half mile to a parking lot on the CT side, and then walked to the Port Chester train station to get into the city. The unit is a duplex with a beautiful kitchen and had everything we needed. Owner always replied quickly to email. Highly recommended and I would love to stay here again. Walk to beaches, parks, restaurants and train station. Activities include biking, tennis, kayaking, and community sponsored activities such as concerts and movie nights. We are a 15 minute walk away from Byram beach and also from Port Chester that offers many restaurants, coffee shops, movie theaters, places to shop and the historic Capitol Theatre. The train station is only a mile away. We are centrally located to explore the Tri State area by car and New York City is about 30 to 45 minutes away by car or train. Greenwich Avenue in Greenwich's picturesque downtown is known for its great restaurants and many upscale shops and is only 7 minutes away by car. Rye Playland is a​ fun old fashioned amusement park and beach in Rye ​that is 10 minutes away by car.